Free Poker Over $14,204,775 in free poker promotions given away! PokerSource got its start on eBay back in 2004 giving away free poker books and free poker chips in exchange for online poker room account signups. 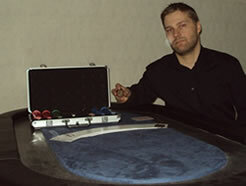 Back then our options were limited, as we only worked with PartyPoker. Because of the tremendous response to our promotions on eBay, we launched PokerSourceOnline. Since that time a lot has changed: although we are still known as PSO to many, we changed our name to PokerSource. We merged our immensely popular free poker money website Instant Bankroll into PokerSource and also merged the original rakeback site Frequent Flopper into PokerSource. This made us a great destination for poker players worldwide to sign up for any promotion they desired all in one place. We also added several more online poker rooms such as TigerGaming & Americas Cardroom. Finally, we added a huge selection of free poker gifts to our Points Store. Despite all the changes, one thing has remained the same: PokerSource is still the #1 source for free poker promotions. Hundreds of thousands of poker players have joined our community and we've shipped millions of dollars in gifts to our members all over the world. If you haven't tried PokerSource yet, the only thing left to ask yourself is "What am I waiting for?" Join us for our Bankroll Builder freeroll at TigerGaming or BetOnline on April 30th. Password and details here. Our friends at Americas Cardroom are hosting a HUGE $5 million tourney that gets under way on July 16th. The buy-in is steep but they offer many satellites so you have a changes to win your way in. See here for details. Earn 3000 extra PokerSource Points when you sign up for our USA-friendly Americas Cardroom Points promotion in April. Details here. Do you think you know who's making it to The Elite 8? The Final 4? Bet the action! See our partner sportsbooks here. Our Bankroll Builder freeroll at Americas Cardroom April 16th is open for registration. Password and details here.